Triple the love! 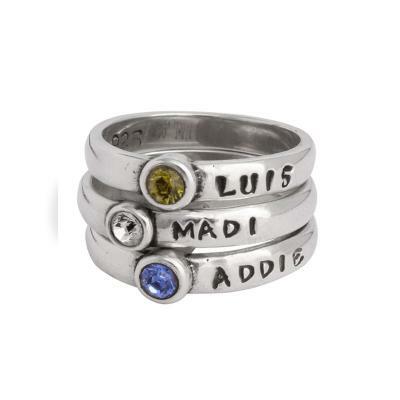 Silver stacking birthstone name rings are the perfect personalized Mother's Ring. Triple the love! Here are the Stackable Mother's Birthstone Rings, a set of three represents your three bundles of joy. Stack the love! Dimensions: The sterling silver bands are approx 3mm wide and can be stamped with up to 12 characters/spaces. The stamping is always to the right of the birthstone setting. We can not stamp on both sides of the birthstone setting or on the inside of the bands. Sizing: When determining your size, we ask that you give us a size that fits comfortably. The rings are available in whole sizes and can vary between the whole size and a quarter size up depending on how long the name is that we are stamping. If you are unsure of your size, you can purchase a ring and select ring sizer from the dropdown menu. We will send you a ring sizer and instructions on how to email us your size. If you are between sizes you need to decide if you want the ring to fit a little snug or loose. We can not resize the birthstone rings because of the setting so please make sure to order the correct size. Please note: Stacking three or more rings will make the total width wider, which will make for a snug fit on your finger so please take that into account and consider ordering a larger size if you plan on stacking 3 or more of these bands. Price includes stamping. Because this item is customized all sales are final. We only use 14K gold,sterling silver, gold vermeil, gold filled and bronze in our products.